A gang of coarse and violent thugs arrives at a farm. One of them gingerly holds a black canvas bag. They storm the farmhouse, capture mother, father and three kids, and after measuring dadâ€™s neck (too thick) end up crazy gluing two pieces of explosives-crammed PVC pipe around momâ€™s neck. According to a tape the terrorists leave behind, the family is to await instructions of how to pay 15 million pesos to have the neck bomb removed. The family obviously doesnâ€™t have this kind of money but the robbers donâ€™t seem to care. The rest of this incredible film follows the familyâ€™s attempt to remove the killer collar. 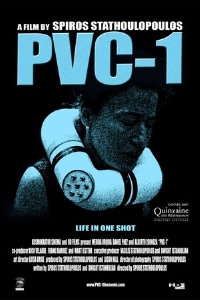 Thatâ€™s as much plot as youâ€™ll get, but make no mistake: PVC-1 is a rare and exotic exercise in existential bleakness you should make every effort to view. How rare and exotic? Iâ€™m not sure how many there are out there, but this 87-minute film happens in real time in one continuous, no cuts take. And no cheating with fast pan blurs, either â€“ the usual way to sneak in a cut. While you would think the overall suspense would be severely limited by this seemingly unnecessarily technical approach, director/ co-writer/ steadicam operator Spiros Stathoulopoulos deftly manages to turn this seeming restraint into an often squirmingly intimate point-of-view, as his restless camera forces us into the heart of the action as a sort of ghostly observer. As the tension builds the cameraâ€™s eye becomes increasingly agitated as well, and you also find yourself desperately seeking relief from the tyranny of helplessness and dread that consumes the characters around you. After awhile youâ€™re relieved none of the characters turns and looks you in the eye â€“ that would have been too much. Itâ€™s all a very compelling yet unnerving trip. Your eyes are unable to leave the proximity of the PVC collar. You arrive with the bomb, watch it being assembled, and then stay when the terrorists leave, only to then embark on a journey to a location where the local bomb squad technician (his tools are a candle, knife and pair of needle-nose pliers) will deactivate the device. And all this, remember, is done in a continuous take. For my money, this artistic feat by steadicam operator Spiros Stathoulopoulos is worth the price of admission. Honestly, there are some shots you just donâ€™t know how he manages, combining physical movement with seamless zoom effects to accentuate not only the tension of the moment, but to create a strong sense of impatience and frustration. One of the more memorable instances comes when the bomb expert arrives. He and mom are sitting about a hundred feet from the onlookers, and his matches donâ€™t work, so he canâ€™t get the candle lit. Dad is a smoker, though, and when the defuser looks for help, Stathoulopoulosâ€™s camera quickly turns, moves towards the crowd and then smoothly zooms in tight on dadâ€™s right hand, revealing the top of a bic lighter. Itâ€™s amazing. And thereâ€™s many other examples. The cast is very strong, although for most if not all of the movie dad (Alberto Sornoza) and the three kids are limited to crying, sobbing, pleading and generally being bummed out. Mom, played with sharp believability by Merida Urquia, is by far the most complete character, and she gives a marvelous performance of a content, fulfilled woman who is one second playing with a cute little fuzzy chick in a shed and the next wearing her mortality around her neck. Stathoulopoulos also manages to work in a nice little anti-religion subplot to this seemingly straightforward thriller. Our family are all staunch Catholics, and throughout the ordeal their main question is the existential â€œwhy me?â€ Mom is obsessed with her rosary, worrying the beads whenever she can, and thereâ€™s one revealing and telling moment near the end when she takes the rosary and places it around the neck of the bomb expert. The point, of course, is to make a subtle correlation between the physical terror of the pipe bomb, and the spiritual terror of what the rosary represents. PVC-1. Itâ€™s unique, bleak and you should give it a peek. The camera work is a piece of art, the cast is strong, the story compelling, and youâ€™ll never look at a piece of PVC pipe the same way again. Nice to hear it's good. For some reason I was afraid it was going to be a bit cheap and badly acted.